Ahead of the release of Zoya Akhtar's underground music film Gully Boy, lead actors Ranveer Singh and Alia Bhatt visited the sets of The Kapil Sharma Show to promote their highly anticipated gully rap film. A short video clip from the yet-to-be aired episode has emerged online, which shows Kapil Sharma introducing his guests Alia and Ranveer, but Ranveer is seen engrossed in a conversation with on his phone, sending air-kisses to the caller. Later, Kapil reveals that the recipient of the call is their 'bhabi' (sister-in-law), referring to Deepika Padukone. 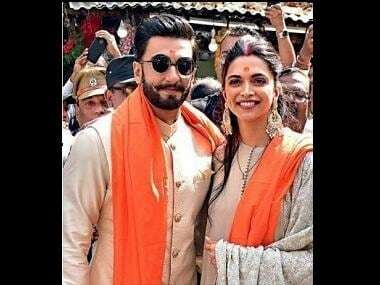 Deepika and Ranveer also attended Kapil's wedding reception in Mumbai, and their dance videos from the event had gone viral. Meanwhile, Kapil's wife Ginni Chatrath also appeared on The Kapil Sharma Show during Shakti Mohan, Neeti Mohan and Mukti Mohan's episode. Chatrath even posed for a picture with Neeti, Shakti and Mukti after the episode. On the same show, Ek Ladki Ko Dekha Toh Aisa Laga actress Juhi Chawla has teased Kapil Sharma about his newfound punctuality, and said that it was 'The Ginni Effect' for which he does not keep his guests waiting anymore.